The HydroSack®️ is the new, modern method to create a highly effective barrier to the threat of floodwater for domestic and commercial properties. 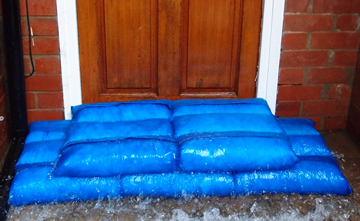 Since it’s launch in 2012, it has fast become the the UK & Europe’s best selling sandless sandbag for domestic & commercial flood protection. 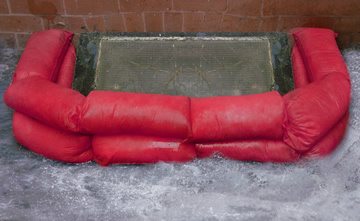 The HydroSack®️ is a water-reactive temporary flood barrier for low-level flooding, constructed from a non-woven outer material with a super absorbent core. 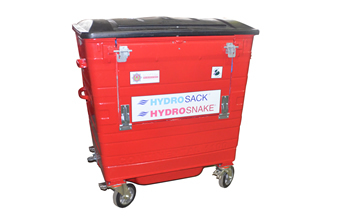 Before use, the HydroSack®️weighs less than 0.5kg, but once the HydroSack®️ comes into contact with water (absorption capacity up to ~20 litres), it can then be used to defend against, and redirect floodwater. 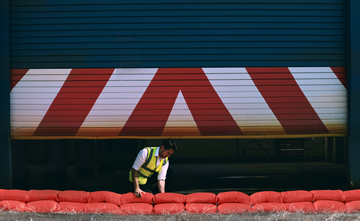 The HydroSack’s®️ handles allow minimal contact, and facilitate positioning of the barrier, making the HydroSack®️ an ideal replacement for the traditional sandbag in forming a flood protection barrier. The HydroSack®️ is safe and easy to dispose of; and the super-absorbent polymer and pulp are both eco-friendly. 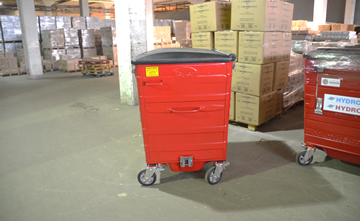 After use, the contents can be dispersed into the ground, or alternatively, they are suitable for landfill or incineration. 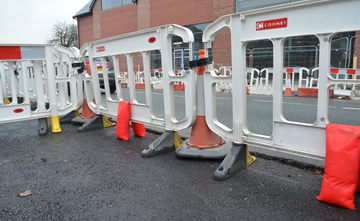 The HydroSack®️ is now being widely used by Fire & Rescue Services UK-wide in fire hydrant pit protection and maintenance, as well as for water redirection & pollution control. How long can they be stored before use? 5+ years if stored in their original packaging and kept dry. How do I inflate/activate a HydroSack®️/HydroSnake®️? The quickest way to fully activate HydroSack®s/HydroSnake®s is to soak them in water using a bucket or tub of water and this will take 2-3 mins per unit. They can also be activated by spraying with a hose, or pouring water onto them, but will take slightly longer than soaking. 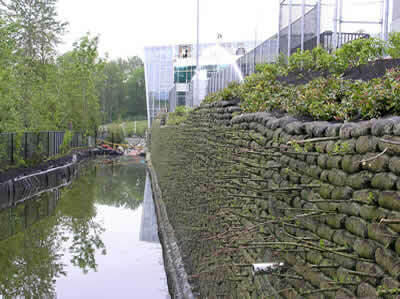 Can I lay them down dry to be activated by flood-water, and will they still be just as effective as a barrier? If activated by flood-water, they are more dangerous to handle/dispose of than those activated by fresh water from a tap/hose as flood-water can be heavily contaminated. Can they HydroSack®/HydroSnake® be reused i.e. will they dry out and return to their original state? Both the HydroSack®️ and HydroSnake®️ will stay effective for 3-6months in situ once fully activated. After this time the product will require disposal. The inner contents of the HydroSack®️/HydroSnake®️ are degradable (to make them safe and easy to dispose of) so cannot return to their original state and be reused. 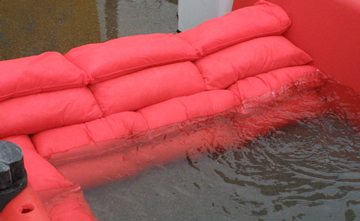 How do I dispose of HydroSack®s/HydroSnake®s after the flooding has subsided? To dispose of a HydroSack®️/HydroSnake®️, simply split the outer bag and the contents can be poured into the ground, and will degrade in a matter of weeks. Ecological studies have shown that the contents pose no negative risk to the environment or wildlife. What is in a HydroSack®️/HydroSnake®️ that makes them swell with water? They contain a mixture of Super Absorbent Polymer (SAP) and FSC (sustainably sourced) wood pulp. SAP is a compound used in disposable diapers and other super absorbent products. The SAP used in HydroSack®s and HydroSnake®s was specifically chosen for its eco-friendly nature, as there are other super absorbent compounds (and therefore other products utilising them in the market) that can be harmful to the environment, and are even banned in some countries. The HydroSnake®️ is the new, modern method to create a highly effective barrier to the threat of floodwater for domestic and commercial properties and ideal for use in pollution control. 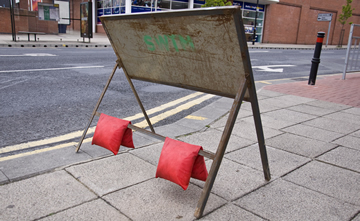 The HydroSack®️ is a water-reactive temporary flood barrier for low-level flooding, water redirection and pollution control, constructed from a non-woven outer material with a super absorbent core. 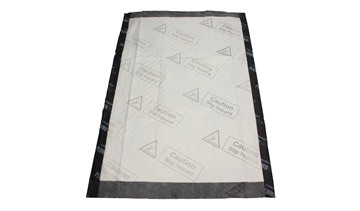 The super absorbent core contains a mixture of superabsorbent polymer (SAP) and wood pulp. Before use, the HydroSnake®️ weighs less than 0.5kg, but once it comes into contact with water (absorption capacity up to ~20 litres), it can then be used to defend against, and redirect floodwater or non-corrosive chemicals/pollutants. Each HydroSnake®️ measures up to 1.45m in length when activated, making it the ideal flood barrier for warehouse doors, garden gates & paths, sports fields and for fire and emergency services. The HydroSnake®️ is safe and easy to dispose of; and the super-absorbent polymer and pulp are both eco-friendly. 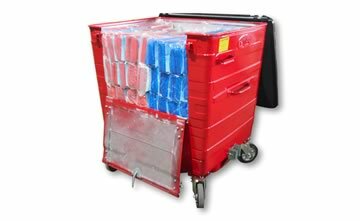 After use, the contents can be dispersed into the ground, or alternatively, they are suitable for landfill or incineration. The HydroSnake®️ is now being widely used by Fire & Rescue Services UK-wide in fire hydrant pit protection and maintenance, as well as for water redirection & pollution control. Can they HydroSack®️/HydroSnake®️ be reused i.e. will they dry out and return to their original state? FloodPODs™ are designed to hold bulk stocks of flood protection product, to be accessed whenever there is a need for immediate flood relief. 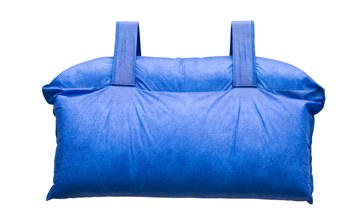 FloodPODs™ are completely weatherproof, with optional bolt-down feet, and can be deployed with ease to any area that is at risk of/prone to flooding. FloodPODs™ are supplied in a variety of colours, with a side access point, lockable wheels or legs, and branding or advertising options. It is a pseudo-permanent feature, allowing for the most effective first response to any flood warning received. 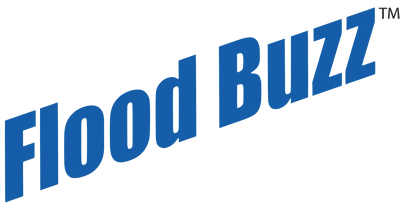 FloodBuzz™ Water Escape Alarms have made monitoring your property for potential water damage incredibly simple. 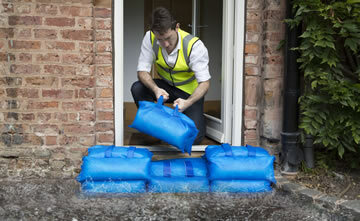 The four models in the FloodBuzz™ range cover the majority of possible leak conditions. There are no batteries to buy, buttons to push, and are completely wireless. 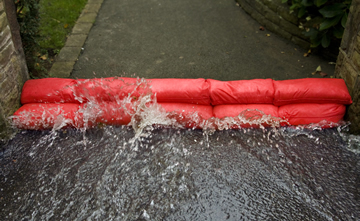 Just position the FloodBuzz™ in an area of potential water escape and forget about it. When in contact with water the FloodBuzz™ will activate and emit an alarm that sounds up to 110dB.FloodBuzz™ alarms will last for up to 3 years and are reusable. 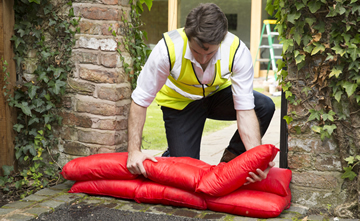 To test the FloodBuzz™ alarm, simply place the base of the unit in water or on a damp cloth. Dry the base prongs and your FloodBuzz™ is ready to be used again. For best guarantee of protection, replace your FloodBuzz™ alarm by the date stated on the outer casing of the unit. With the FloodBuzz™ range of water leak alarms, you can now be warned of water leaks when they happen. FloodBuzz™ alarms have become critical tools in warning homeowners, building managers and landlords of water leaks that may lead to water damage and mould, before they become costly problems to repair. How long will the FloodBuzz™ last? The FloodBuzz™ has a fixed battery life of up to 3 years. For the best guarantee of protection, we recommend that you replace your FloodBuzz™ by the date stated on the outer casing of the unit. Where should I put my FloodBuzz™ for the best early warning of flooding? Your FloodBuzz™ is best placed in a place where it is most likely to detect a leakage or a flood: Under a sink, in a boiler cupboard, a bathroom, or in your basement- anywhere where there may be risk of water escaping on your property, domestic or commercial. The base of your FloodBuzz™ should touch the floor. The FloodBuzz™ Small has a height of 3cm, and a diameter of 4cm. The FloodBuzz™ Pro is 6cm in height, and has a diameter of 5cm. 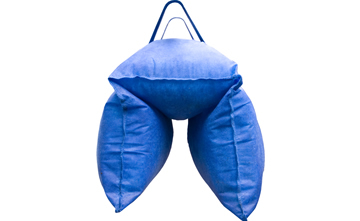 The FloodBuzz™ Blue has dimensions 10cm in height, and a base area of 4×1.5cm. All three are incredibly discreet, and will fit into small spaces perfectly. How loud is the FloodBuzz™? The FloodBuzz™ Pro and the FloodBuzz™ Blue sound up to 110 decibels, and the FloodBuzz™ Small sounds up to 95 decibels. Gravitas International is proud to have become the Master Distributor of FlexMSE® for the UK & Ireland as of March 2017. 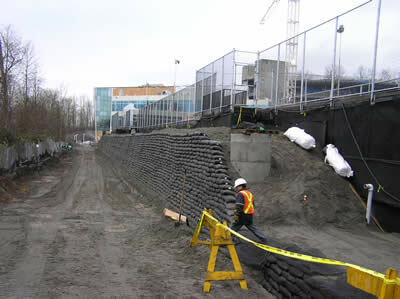 The FlexMSE® Vegetated Wall System is a unique patented engineering solution for vegetated retaining walls and erosion control. Using MSE (mechanically stabilised earth) principles along with geotextile technology, the combination of nonwoven FlexMSE® bags and patented interlocking gripper plates allows for strong and easy-to-install geomodular block structures. FlexMSE® bags are filled with a mixed of sand & soil, and can be formed into near vertical (85°) retaining walls, green landscaping structures and erosion resistant sidings to rivers and coast-lines. The patented gripper pads, made from 100% recycled materials, are placed between the layers of filled bags to add to the strength and stability of the structures constructed. 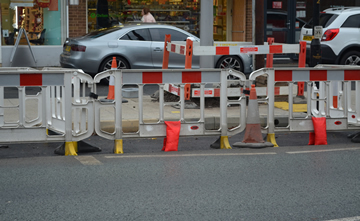 FlexMSE® is commonly used in conjunction with Geogrid products. 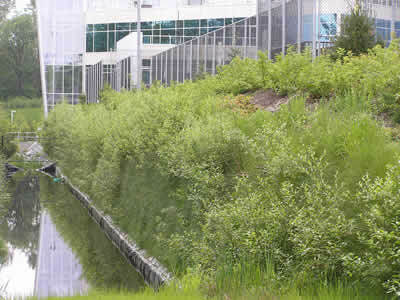 FlexMSE® is suitable for hydroseeding, live staking, live planting and brush layering, and is water & root permeable. With a design life of 120+ years and a 75-year warranty, FlexMSE® structures withstand almost unlimited differential settlement (up to 2m). 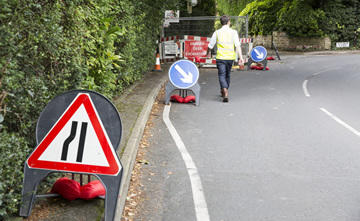 No more man hours wasted, filling up sandbags for weighing down signage – a lone site operator can activate hundreds of sandless sandbags within minutes with TrafficSack®️. 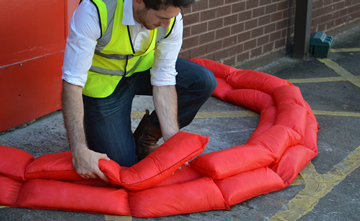 Weighing less than 0.5kg before use, once in contact with water, a TrafficSack®️ absorbs until the required weight is achieved. 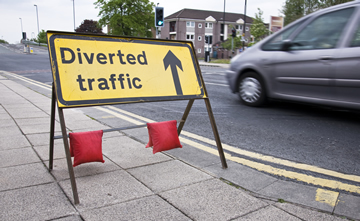 The TrafficSack®️ is available in both a 7kg or 12kg capacity, making them suitable for all highway and Chapter 8 DOT ballast requirements, and for both traditional and modern road signs. TrafficSacks®️can be stored for 5+ years before needed, and will last 3-6 months in situ once activated. 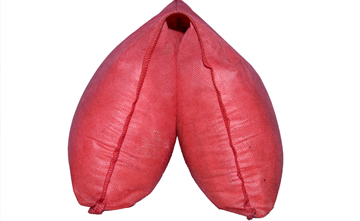 The TrafficSack®️ is eco-friendly and easy to dispose of after use. The PlumbPad®️ is an innovative solution to domestic and commercial leaks & spills for water-based fluids. 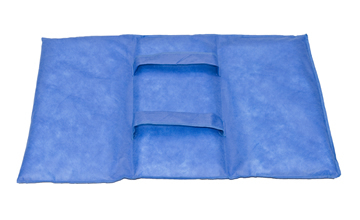 One PlumbPad®️ absorbs & locks in up to 2 litres of water, preventing water-damage that can be caused by leaky pipes, bleeding radiators, faulty appliances or general mishaps.The PlumbPad®️ can also be used to line the bottom of office waste bins to absorb excess fluid and prevent mess when replacing bin-bags. Once in contact with water, the PlumbPad®️ immediately locks in any fluid that it comes into contact with. The PlumbPad’s®️ plastic backing will protect flooring and carpets from any potential water damage. The PlumbPad®️ contains super-absorbent polymer and pulp; both are eco-friendly and degradable once disposed of. How large are the PlumbMat® and PlumbPad®️? 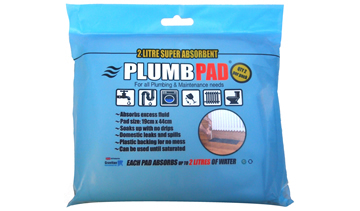 The PlumbPad®️ has a 19x44cm absorbency area, allowing it to fit into smaller, tighter spaces. It can lock in up to 2 litres of water, and can be used until it is fully saturated. 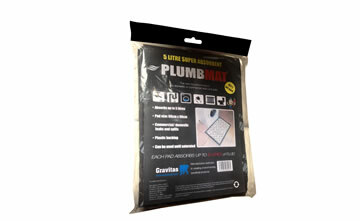 The PlumbMat®, meanwhile, measures 60x90cm, and can absorb up to 5 litres of water, making it handy for larger domestic or commercial leaks and spills. When should I use PlumbMat® or PlumbPad®️? PlumbMat® is useful for larger leaks and spills, with a total absorbency area of 60x90cm. It is suitable for both commercial and industrial use. PlumbPad®️, too, is recommended for both domestic use and commercial use. 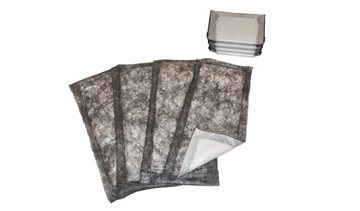 Its small size enables it to be used for general maintenance, small spills, and residual water absorbance. The PlumbMat®️ is the new innovative solution to commercial and industrial leaks & spills for water-based fluids. 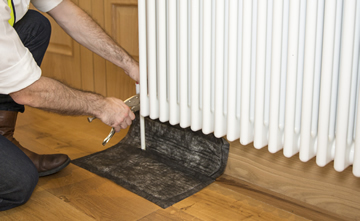 One PlumbMat®️ absorbs and locks in up to 5 litres of water, preventing damage that can be caused by machines, appliances, leaking roofs or general mishaps. Once in contact with water, the PlumbMat®️immediately locks in any fluid that it comes into contact with. The PlumbMat’s®️ plastic backing protects floorings and carpets from any potential water damage. The PlumbMat®️contains super-absorbent polymer and pulp; both are eco-friendly and degradable once disposed of. Slip hazard warning symbols are printed on the face of the pad to avoid any potential safety hazards when the PlumbMat®️ is deployed in the workplace. 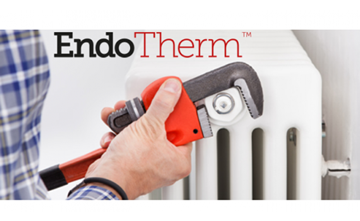 EndoTherm is designed to increase the efficiency of wet central heating systems, proven to decrease energy costs by up to 15% in domestic, commercial and industrial applications. It is a natural additive, decreasing the surface tension of the water within the system, therefore increasing conduction of heat from radiators, whilst decreasing load on the boiler. 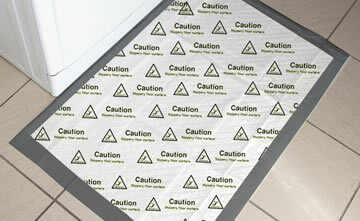 This in turn increases the rate of heat transfer, and the longevity of heat retention. There has been significant testing on its performance from independent facilities. EndoTherm has been confirmed by leading boiler manufacturers as non-corrosive, and does not void any warranties. In addition to this, it also works in conjunction with the leading inhibitors. How Much EndoTherm Do I Need? In domestic usage, an average 10-12 single radiator home requires one 500ml bottle of EndoTherm. If your home is larger than average (or has more radiators/underfloor heating) you will require 1 litre (2 x 500ml bottles). Commercially, 1 litre per 100 litres of system volume is satisfactory. 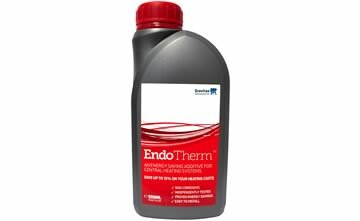 Experts from Endo Enterprises can calculate exactly how much EndoTherm will be required to maximise the potential return on investment. Does EndoTherm work in any heating system? Yes- in any heating system where a boiler is used to heat water, EndoTherm will work. How long does EndoTherm last? EndoTherm will remain in a closed central heating system without any deterioration of energy savings for at least 4 years, according to tests. How do I install EndoTherm? EndoTherm can be added to a system using a feed and expansion tank or via a partially drained radiator. EndoTherm is not dangerous to touch. It has the official classification of a ‘mild irritant’ but carries no hazardous threat.